Greetings ghosts and goblins, this is Cryptkeeper Bubbawheat here once again for day 27 of our fantabulous feast of the faithful fans featuring another fable from our favorite show Tales From the Crypt. Today’s fearless female is Kristen Lopez from her site Journeys in Classic Film where as you might expect, she has been taking a journey in classic film, tackling mainly classic Hollywood from the 40’s through the 70’s along with the occasional dip backwards or forwards as she sees fit, including many trips to the Disney vault where she may or may not find some of my old fiendish friends tucked away in a dusty corner. But today she is looking at what could be called the Goonies of the show since it does, in fact, include one of the Goonies himself as well as a boy who would soon meet world, or at least be friends with a boy who would meet world for a few episodes before he grows up step by step. This is also one of the most misread episode titles as it does not refer to a room, or parlor, but instead refers to the paleness of the skin which is often associated with death, or you might say an Undertaking Palor. The episode follows four teenage boys who stumble upon the fact that the local undertaker (John Glover) is defiling corpses and selling shoddy funerary supplies. When one of the boy’s fathers is killed as part of the undertaker’s schemes, the group embarks on a mission to expose him. I picked Undertaking Palor for a few reasons: It’s an obvious take on The Goonies – going so far as casting Jonathan Ke Quan who played Data in the Richard Donner film – and is one of the earliest examples of the found footage film, albeit with clunky 1990s camcorders. Mostly though I picked it because it’s about undertakers. I’m morbidly fascinated with funerary sciences, maybe as a means of dealing with my own issues with death. Dying is the one grand adventure we’ll all embark on, a fact as terrifying as it is inevitable, and Undertaking Palor shows that it’s not just death worth fearing, but how your body will be treated in its most helpless state. Watching the maniacally happy Sebastian smash in a corpses’ face with a sledgehammer is atrocious, not simply because it’s a corpse but the reckless, cartoon abandon with which he does it. 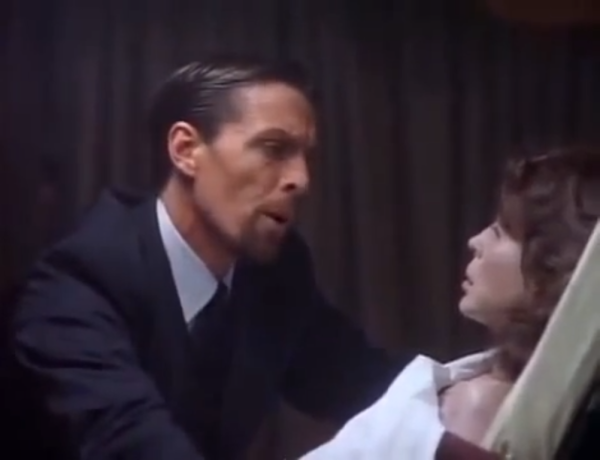 Make no mistake, this episode lives and dies (pun intended) on John Glover’s performance as the undertaker Sebastian. His polished demeanor always conveys a slight hinge of madness without ever devolving into maniacal laughter. He walks on the knifepoint between madness and sanity, looking prim and proper all the while. Watching him opine to corpses before desecrating them, aided by some grim corpse effects, could leave things campy and cartoonish if you weren’t creeped out. Glover’s elegance stands in stark contrast to the four boys who seem ripped from an Animal House dinner theater production. 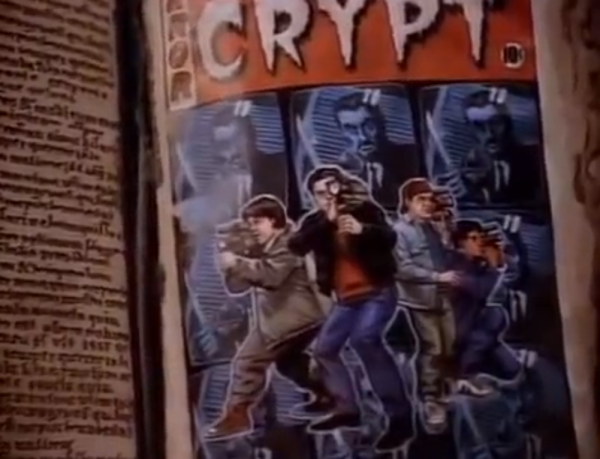 Despite the presence of Quan and Jason Marsden, the boys here are all written so poorly. Ron Finley’s screenplay leaves them spouting inane dialogue more as a means of getting in F-bombs than saying anything important. It’s as if Finley wants to give us kids who have just discovered cursing. There’s also an odd air of timelessness, or at least the filmmaker’s intention of wanting the kids to be from an unspecified area, what with Jason Marsden dressed like James Dean and the town looking early 1950s. However this effect is lost the minute the video cameras come out. Yes, the video cameras. The film has some great moments of suspense before the group shows up with their Panasonics. Their first foray into the funeral home, hiding in various places, leaves you on the edge of your seat. 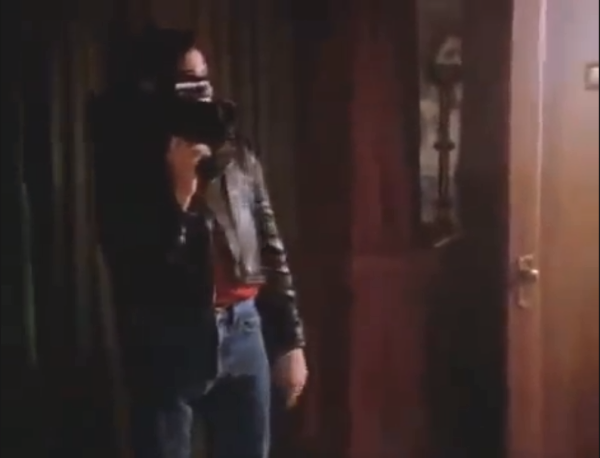 When the group goes in to expose Sebastian, they plant a camera and the third act is briefly shot through the camera’s POV. The effect isn’t utilized long, but considering this was 1991 I remember camcorders being clunkier and more obtrusive. And, of course, the final moments involve a failing battery. Overall, Undertaking Palor isn’t the series’ best, but John Glover is creeptastic and makes up for any of the episode’s shortcomings, usually stemming from the boys’ childish antics.